The US and Japan have revealed new defense guidelines, expected to be revealed Monday as PM Shinzo Abe is on a visit to Washington, which may cause considerable unease in China. Under the revised guidelines, Japan would be able to come to the aid of US forces threatened by another country and would be able to deploy minesweepers to the Middle East, officials said. This is widely interpreted as joining US forces in any possible conflict on the Korean Peninsula, where Japanese forces would give “rear area support” to the US. "These guidelines eliminate the geographic restriction on US-Japan cooperation," a senior US defense reporter told reporters. As well as expanding its geographical presence, Japan’s military is also expected to diversify into areas such as cyber security and counter terrorism. They follow a cabinet resolution last year that reinterprets Japan’s pacifist constitution which has been in place since the end of the Second World War. This still needs to be formalized by legislation later this year but will basically allow for Japan’s military to provide logistical support to US forces beyond Japan’s immediate neighborhood without a specific law being passed each time. The details of the new guidelines are expected to be revealed on Monday when the Japanese Foreign Minister Fumio Kishida and the Defense Minister Nakatani meet US Secretary of State John Kerry and US Defense Secretary Ash Carter in New York. The meeting is the centerpiece of Abe’s visit. 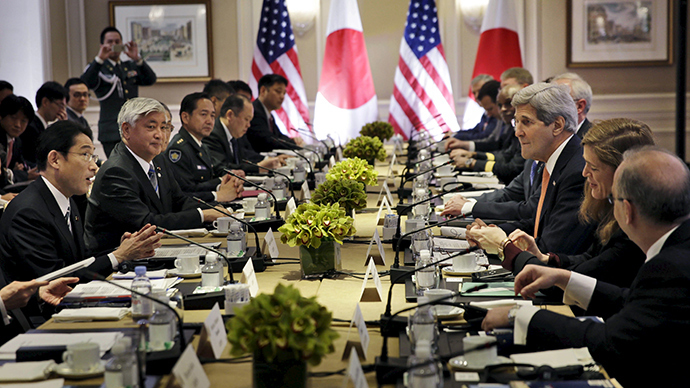 Japan will also likely be looking for assurances from Washington that it will still come to Japan’s aid if necessary. Meanwhile in Japan Abe’s critics say he wants to whitewash Japan’s wartime past while his conservative allies think it’s time after 70 years since the end of the war to take a greater role on the world stage and that fresh apologies are not needed. There is also considerable alarm in Japan over China’s military modernizing, as Beijing increasingly flexes its muscles in Asia. China is surrounded by US bases from Thailand to South Korea. Beijing is concerned at Abe’s more nationalist outlook and his defiant stance on history and territorial issues, which contradict his claim that he is a defender of peace. There is also concern in china that Washington is using Tokyo as a means of pursuing its decade’s old policy of containing China. Tim Beal, an Asia specialist told RT that the US will try and use Japan to counter Chinese dominance in the region. “Japan is basically using China as an excuse and it’s using it because the only way the Americans will accept Japanese remilitarization is if they think Japan can be used against China,” he said. He added that Japanese militarization will bring some benefit to the US’ huge military industrial complex.